What is your favorite mustard or mustards? Since most mustards do not have to be refrigerated and dry mustard takes up little space, it is a good addition to the cruising larder. In general, I'm not a mustard person. I really don't like the traditional yellow American mustard we see on hamburgers and hot dogs. However, I do keep dry mustard and use it when making macaroni salad, deviled eggs, etc and I love hot mustard with my egg rolls...and...I absolutely love a kind of stone ground mustard that has me thinking there's "more" to mustard than I previously thought. 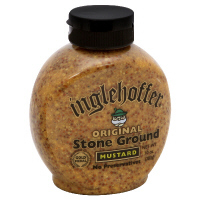 The stone ground mustard is Inglehoffer "original" stone ground. Its actually a little bit sweet and its quite "chunky" too. Looking at the label I see it has the stone ground mustard seeds, three kinds of vinegar--red wine, white wine, and white; then it also has sugar, salt, and turmeric. Yummy stuff. Anyone had it? There's nothing traditional about american mustard. It's a very nasty and extremely poor imitation of the European/English varieties. Get your hands on a good traditional German mustard, or a nice hot English or even one of the Provencal varieties and you'll see what I mean. I think my favourite is an Austrian seeded mustard I found in a specialty store out here once, although it's hard to get. I quite like a Dijon mustard if it's well made but there are some appalling imitations of that to be found on supermarket shelves too. A coffeespoonful will set your eyeswatering until the next !!! I absolutely agree! HOT ENGLISH by Coleman's. "Mustard" should not be confused with general "Mustard Sauce". I concur, nothing else like it, you can mix it as strong or as weak as you like, it stores well and a little goes a very long way. Coleman's dry mustard is so variable, mix it with milk, mayonnaise, a little vinegar, or any other "wet" ingredient and it changes nicely. I "discovered" Inglehoffer mustard last year, but it immediately disappeared from the grocery shelves. Have to drive a ways to get it now. Where our summer (and holidays) house is we have trouble finding food beyond the bland ever since the only Chinese supermarket within 50 miles has gone out of business. I had to buy a case of Sambal Oelek when we were in the Netherlands last year (mixed with chopped garlic it seasons everything just right for me without raising complaints from everybody else that my food is too "hot" or whatever). I just dug up and grated our entire crop of horseradish, and got about a quart of prepared horseradish to share with family and to use for the holidays. It's a lot of work, but the horseradish is far superior to what can be bought in the store. I mix it with the bland mustard or mayonnaise that Peter uses to brighten up my food. People in this part of the state have a taste for very bland food, so I have to label buffet food to warn them of anything with any bite. My brother is a boyscout (leader or something), and last weekend was the annual campout to introduce Cub Scouts to Boy Scout activities. It's the best food on a camping trip that they'll get as a Boy Scout. My brother likes flavor, too, so he brings his own spices and such with him. One of the Cub Scouts, smelling his blackened sea scallops, asked him if he had any Cayenne pepper, so my brother passed that over to the kid. The kid then asked, "you wouldn't have any Tabasco sauce, would you?" And my brother passed that over, too. He watched the boy powder his food with the cayenne, then douse it with the tabasco, eat with relish and sigh, "not very spicy, but pretty good, but we're from Louisiana." I miss SE Asia and its food. I agree on American mustards, they are terrible. I prefer French mustards, made in France not the ones with a French name made in the US. Mustard is essential on the boat. Not only for sandwiches but as an ingredient to several sauces.